Such a good day up the mountain today, and guess who was working? Had a day off today and was going up skiing, but after waiting for the bus for one and a half hour we gave up. Decided to go jet boating instead. Pretty cool boat ride in shallow water with rocks so close to the boat. Found an abandoned old boat on the way home from town. Took some pieces of wood that we used as paddles and then went fishing. 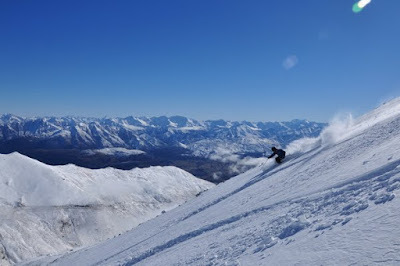 Some pictures from last month's skiing up Remarkables. Hoping to get some nice shots in the park the coming weeks.